Something to watch out for in the coming 2012 London Olympics is the Digital Cloud project of the MIT (Massachusetts Institute of Technology) that will be implemented as one the event's highlights. 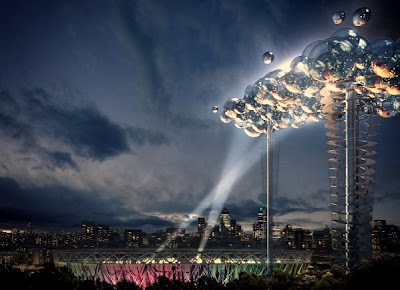 It will literally be a giant cloud that will be floating in the skies with the support of two 400-foot mesh towers. This digital cloud will be made out of inflatable plastic bubbles and to be used as an observation deck that projects images and data showcasing specially the happenings and highlights of the Olympic event in real time. One of its features is the "zero power" technology as it will harvest all the energy it produces and is purely based on a combination of solar power and regenerative braking to convert potential energy into useful electricity. This will definitely be a massive digital display that will be witnessed by a great audience in London's vicinity.